Attention. Yandex Browser warns you when you navigate to a dangerous site, but it is not a full-fledged antivirus product. However, Protect technology defends your browser against computer threats that antivirus programs do not block. We recommend using both for full protection. by warning you if a page is infected. Before you open a page, Yandex Browser checks it against a list of infected pages. Addresses of infected pages are stored in a special database compiled by Yandex and our partners. Any page detected in the database is blocked. If a copy of the uninfected version of the page is stored in Yandex, you can view it. To do this, click the link to the page with full information on the threat, and then click Safe copy. The page with full information on the threat also provides information on what malware was detected on the page. You are allowed to ignore the warning and visit a site with dangerous content. Attention. However, we strongly recommend that you don’t visit a website with dangerous content. Malicious codes can infect your computer or give hackers access to your personal information and electronic payments. After visiting the page, scan your computer with an antivirus or free utilities. Note that these actions do not protect against infection, but only make it less likely and help with recovery. The security mechanism in Yandex Browser doesn't conflict with other security applications (anti-virus software and firewalls). If antivirus software is installed in the system, it can detect malware sooner than the browser. In this case, you will see a message from the antivirus rather than the browser. If Yandex Browser blocked your site because it’s infected, delete the malicious code. On the next indexation, the Yandex robot will exclude your site from the dangerous list. You can use Yandex.Webmaster to speed up indexing. To do this, click the Recheck button in the Security and violations section. We recommend that you regularly repeat the check for several weeks after infection. This will help detect malware if it was not completely removed the first time. Follow the security rules to protect your site from infection. If you register a site in Yandex.Webmaster, you will be able to get email notifications about infections and view details of infected pages in the Security and violations section. Attention. 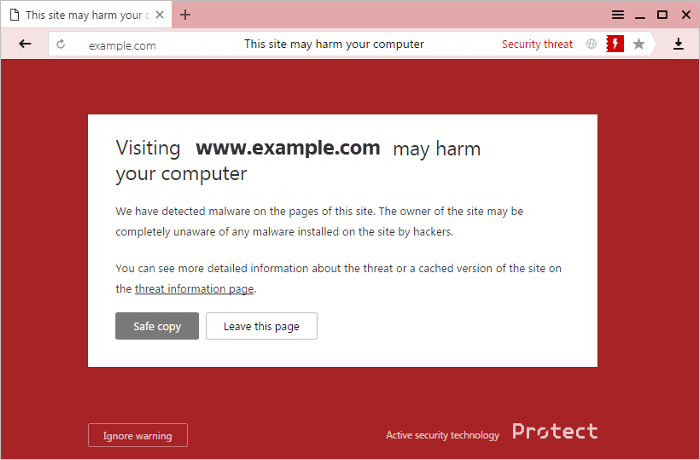 If you want to disable blocking of dangerous pages, you will have to completely disable protection against malware and malicious sites in the browser. We strongly recommend that you don’t do this. Use a similar sequence of actions to re-enable blocking of dangerous pages.